The NFL regular season has arrived. The Philadelphia Eagles opened the season on Thursday beating the Atlanta Falcons 18-12 and a full slate of games follow on Sunday with the week ending with Monday Night Football. Offensive skills position players receive most of the headlines but it is the defense that often times is the difference between a good and great NFL team. While sportsbooks have several props for bettors to choose from on the offensive side of the ball, there are fewer for defensive players with the biggest being NFL Defensive Player of the Year. 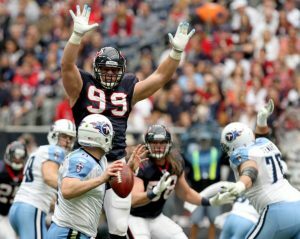 As the season begins, the favorite on several sportsbooks is Houston’s J.J. Watt. The defensive end is now at +565 to take home the award. Watt is trailed closely by the Chargers’ Joey Bosa at +585, the Rams Aaron Donald +590, the Bears Khalil Mack at +700 and the Broncos Von Miller at +950 to round out the top 5. Donald, who was last year’s Defensive Player of the Year, signed a new contract with the Rams for $135 million. In 2017, Donald had 41 tackles and 11 quarterback sacks. For a week or so he was the highest-paid player on defense in the NFL in league history until Mack was dealt by the Raiders to the Bears and signed a $141 million deal. Mack won the award in 2016. While the top five players with the best odds are fully deserving of winning the award, there are other players with higher odds but still hold solid value on the futures board for sports bettors. One such player is Jalen Ramsey with the Jacksonville Jaguars. The Jaguars defense was No. 1 in several categories last season and this season will be as good or better. Ramsey, who is just 23, is one of the NFL’s best cornerbacks and at +1800 holds solid value for those who are not interested in the favorites. Another solid choice would be Calais Campbell. The Jaguars defensive end played nine seasons with Arizona prior to joining the Jaguars in 2017. Last season with the Jaguars, Campbell had 43 tackles and 14.5 quarterback sacks. At a price of +3450 Campbell is a strong choice for those that like long shots.